Objective Ataxia-telangiectasia (AT) is a rare, severe, and ineluctably progressive multisystemic neurodegenerative disease. Variant AT phenotypes have been described in patients with mild- and late-onset neurologic deterioration and atypical features (dystonia and myoclonus). We report on the clinical characteristics and transcriptome profile of patients with a typical AT presentation and genotype who experienced an unexpected favorable course. Methods A 24-year-old woman developed, by the age of 3 years, all the classic symptoms of AT associated with increased alpha-fetoprotein levels, a compound AT-mutated (ATM) genotype with an inframe deletion c.2250G>A (p.Glu709_Lys750del42) and a missense mutation c.8122G>A (p.Asp2708Gln), and no residual ATM protein expression. By the age of 12 years, ataxia slowly disappeared, and a very mild choreic disorder was the only neurologic feature in adulthood. Brain MRI was normal. The blood transcriptome profile was assessed and compared with that of healthy controls and patients with the classic AT phenotype. Results The atypical clinical course of the patient was associated with a transitional transcriptome profile: while 90% of transcripts were expressed as in patients with the classic AT presentation, 10% of transcripts were expressed as in healthy controls. Conclusions The unexpected mild clinical outcome and transcriptome profile of this patient with AT suggest the existence of individual resilience to the altered ATM synthesis. Because of their possible prognostic and therapeutic implications, the identification of modifier factors affecting the phenotype would deserve further studies. Here, we report on a new clinical variant with an early progressive course, late remission, and stable neurologic status until adulthood, despite the classic ATM genotype and absent ATM protein. Accordingly, blood transcriptome in this case showed a pattern of alteration intermediate between healthy controls and severely affected patients. A 24-year-old woman was born after a normal pregnancy and delivery from healthy unrelated parents. Psychomotor development was normal until the age of 16 months when trunk swaying was noticed by the parents. On examination, she was found to have mild trunk ataxia, external beating nystagmus, mild conjunctival angioectasias, and subcutaneous angiomas in the lumbar and calf regions. Brain MRI and sensory and motor nerve conduction velocities were normal. Blood immunoglobulin A (IgA) levels were marginally decreased (78 mg/100 mL; r.v. 85–450), whereas the AFP level was increased (37.5 ng/mL; r.v. 0–10). Chromosome analysis revealed a 7;14 rearrangement, and the radiosensitivity test demonstrated increased chromosome instability. No residual ATM protein expression or activity was found. Molecular analysis of the ATM gene disclosed a compound heterozygous genotype with an inframe deletion c.2250G>A, p.(Glu709_Lys750del42) and a missense mutation c.8122G>A, p.(Asp2708Gln). In the following years, trunk ataxia worsened and other neurologic features, such as motor impersistence and chorea of the trunk and limbs, slurred speech, and hypometric saccades, emerged. Nevertheless, the ability to walk autonomously was preserved, and she could attend a normal school and conduct a normal life. Mental development was normal: at the age of 7 years, the Wechsler Intelligence Scale for Children-Revised IQ score was 92. Starting from the age of 12 years, trunk ataxia progressively disappeared. On examination, at the age of 24 years, she presented with only mild clumsiness associated with nondisabling choreic movements of the limbs (video, links.lww.com/NXG/A47). The International Cooperative Ataxia Rating Scale score was 2 (normal 0). Brain MRI was normal. She maintained normal mental functioning (Wechsler Adult Intelligence Scale IQ score 110, Verbal IQ score 104, and performance IQ score 79) with adequate personal and social skills. She never had pulmonary infections; MRI of the lung performed at the age of 21 years was normal. Her menses were irregular, and she had polycystic ovarian syndrome. She underwent surgical removal of ameloblastoma of the mandible. Recently, ultrasonography has revealed a fatty liver disease in the absence of dyslipidemia or abnormal liver enzymes. At the age of 22 and 24 years, the AFP level was 115 and 190 ng/mL, respectively; the serum IgA level was normal. The patient provided informed consent for participating in the research and publishing the resulting data. She also provided consent to disclose of any recognizable person in the video. We describe an unusual AT phenotype, characterized by a clinical presentation mimicking the classic severe form with the typical biomarkers of this condition, such as absent ATM protein,7 14 chromosome rearrangement, and increasing levels of AFP, with an unexpected favorable course of neurologic disorders during teenage years. In contrast to these cases, our patient experienced the classic presentation and course of the disease until the end of the first decade of life when progressively ataxia vanished, leaving a mild and stable choreic disorder. Nevertheless, AFP and some systemic manifestations of AT (such as ovarian polycystic syndrome, liver steatosis, and neoplasm) occurred. The assumption that the AFP level may mirror the progression of the disease remains debated.8 In our patient, the AFP level increased, despite the improvement in neurologic disorder. The atypical favorable outcome reported in our patient suggests the possible effect of epigenetic modifying factors, which may confer resilience to the disease in some subjects. One modifying factor of the effect of ATM loss has been identified in the Rad50s allele of the gene encoding the Rad50 component of the Mre11/Rad50/Nbs1 complex. In the murine model, Rad50s has a role in alleviating senescence, radiosensitivity, and tumor formation, all hallmarks of ATM-deficient mice.9 Moreover, recent data suggested a pivotal role of the Rad50 hook domain in influencing the Mre11 complex-dependent DNA damage response. In our patient, peripheral Rad50 expression overlaps that detected in patients with AT with a typical phenotype. A further hypothesis concerns the variability in the maintaining of the cellular balance of reactive oxygen species, which cause, among the others, defects in hematopoietic stem cells10 and neurodegeneration. 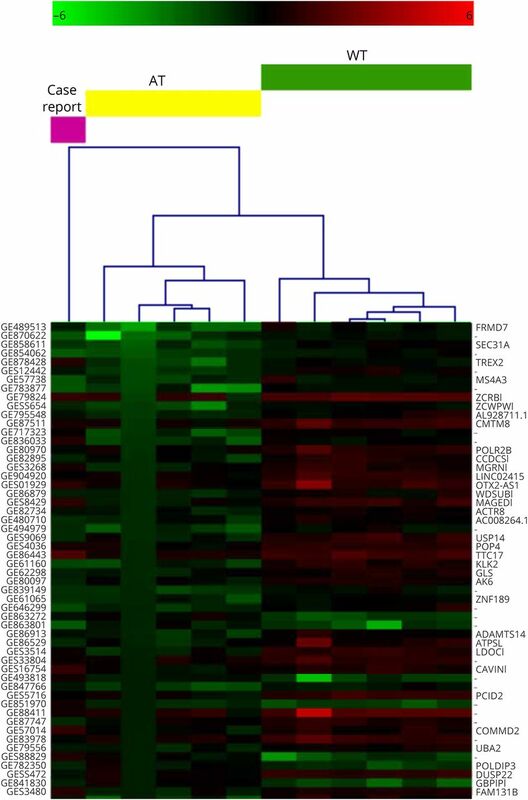 In a recent article, we identified the transcriptome profile of patients with AT with respect to healthy controls.5 The present case exhibited transitional probe expression from that found in patients with classic AT and healthy controls. However interesting, this result requires caution because only known probes were screened while we were unable to determine whether unknown and unpredicted contributing events, such as splicing pattern alteration, could take place. In any case, the observed gene expression variation was part of the final outcome of the patient's biological individuality. The 2 most important genes expressed were scrb1 and thoc3, which are involved in wound reparation and genome stability, respectively. Thoc3 is part of the THO complex, which plays a role in transcriptional elongations, nuclear RNA export, and genome stability. The finding of a transitional transcriptome profile suggests the occurrence of modifying factors possibly influencing individual vulnerability and resilience to the altered ATM synthesis resulting in an unexpected mild outcome. Vincenzo Leuzzi and Daniela D'Agnano: drafting/revising the manuscript, analysis and interpretation of clinical and biochemical data, and acquisition of data. Michele Menotta: drafting/revising the manuscript, analysis and interpretation of biochemical data, and acquisition of data. Caterina Caputi: drafting/revising the manuscript, analysis and interpretation of clinical and biochemical data, and acquisition of data. Luciana Chessa: drafting/revising the manuscript, analysis and interpretation of clinical and biochemical data, and molecular analysis interpretation. Mauro Magnani: drafting/revising the manuscript, analysis and interpretation of clinical and biochemical data, and acquisition of data. V. Leuzzi, D. D'Agnano, M. Menotta, C. Caputi, and L. Chessa report no disclosures. M. Magnani has served on the scientific advisory board of, holds stock/stock options in, and/or receives board of directors' compensation from EryDel SpA; holds a patent regarding a method for the encapsulation of agents within erythrocytes; and has received research support from EryDel SpA and Fondazione Cassa di Risparmio di Fano. Full disclosure form information provided by the authors is available with the full text of this article at Neurology.org/NG. Accepted in final form November 29, 2017.
. Ataxia-telangiectasia: from a rare disorder to a paradigm for cell signaling and cancer. Nat Rev Mol Cell Biol 2008;9:759–769.
. Serum-alpha-fetoprotein levels in patients with ataxia-telangiectasia. Lancet 1972;2:1112–1115.
. Clinical spectrum of ataxia-telangiectasia in adulthood. Neurology 2009;73:430–443.
. A-TWinnipeg: pathogenesis of rare ATM missense mutation c.6200C>A with decreased protein expression and downstream signaling, early-onset dystonia, cancer, and life-threatening radiotoxicity. Mol Genet Genomic Med 2014;2:332–340.
. In vivo effects of dexamethasone on blood gene expression in ataxia telangiectasia. Mol Cell Biochem 2017;12:126.
. Cytoscape: a software environment for integrated models of biomolecular interaction networks. Genome Res 2003;13:2498–2504.
. TM4: a free, open-source system for microarray data management and analysis. Biotechniques 2003;34:374–378.
. Alpha fetoprotein is increasing with age in ataxiatelangiectasia. Eur J Paediatr Neurol 2007;11:375–380.
. The Rad50S allele promotes ATM-dependent DNA damage responses and suppresses ATM deficiency: implications for the Mre11 complex as a DNA damage sensor. Genes Dev 2005;19:3043–3054.
. Regulation of oxidative stress by ATM is required for self-renewal of haematopoietic stem cells. Nature 2004;431:997–1000.